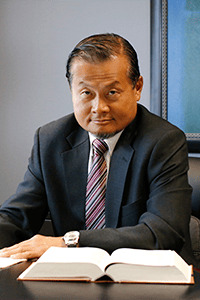 T. Edmund Chan is an independent lawyer who works in close association with The Law Firm of Ted Yoannou, Professional Corporation. Edmund earned his BA from University of Washington (1989), MA from State University of New York at Albany (1990), MPA from University of Southern California (1991) and LLB from Osgoode Hall Law School (1994). He was called to the bar in 1996 and has exclusively practiced criminal law since then.